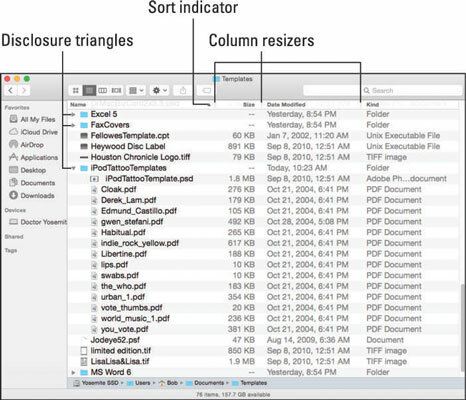 List view offers the little triangles to the left of each folder, known as disclosure triangles, which let you see the contents of a folder without actually opening it. This view also allows you to select items from multiple folders at once and move or copy items between folders in a single window. Finally, it’s the view used to present Spotlight search results. To display a window in List view, click the List view button on the toolbar, choose View→As List from the Finder menu bar, or press Command+2. To disclose a folder’s contents, click the triangle to its left or, if it’s selected, press the right-arrow key. The figure shows the result of either clicking the triangle to the left of the iPodTattooTemplates folder or selecting (highlighting) the iPodTattooTemplates folder and pressing the right-arrow key. If you press Option+right arrow, all the folder’s subfolders also expand. Had you pressed the Option key before pressing the right-arrow key, any folders in the iPodTattooTemplates folder would have expanded along with iPodTattooTemplates. And if any of these subfolders had contained any subfolders, they too would have been expanded. Click the column header to sort items in List view. Notice the little triangle at the right edge of the selected column (the Name column). That’s the column’s sorting indicator. If the triangle points upward, the items in the corresponding column are sorted in alphabetical order; if you click the header (Name) again, the triangle will flip over to point downward and the items will be listed in the opposite (reverse alphabetical) order. This behavior is true for all columns in List view windows. You can change the order in which columns appear in a window. To do so, press and hold a column’s name, and then drag it to the left or right until it’s where you want it. Release the mouse button, and the column moves. The exception (isn’t there always an exception?) is that the Name column always appears first in List view windows; you can move all other columns about at will. In fact, you can even hide and show columns other than Name if you like using the View Options window. It’s even easier to hide or show columns by right- or Control-clicking anywhere on any column header (as shown on the right side). Column names with check marks are displayed; column names that are unchecked are hidden. You can fine-tune all four views and the Desktop by using the View Options window. Just choose View→Show View Options or press Command+J. The options you see apply to the active window or the Desktop. Click the Use as Defaults button to apply these options to all windows in that view (that is, Icon, List, Column, or Cover Flow). To widen or shrink a column, hover over the dividing line between that column and drag left or right. When your cursor is over the dividing line in the header, it changes to a double-headed resizer.